We are pleased to announce that our forthcoming edited volume on the history of the Australian far left in the Cold War era has been put up on the Routledge website, with a Table of Contents. Unfortunately it is not available to pre-order just yet. We hope this is rectified soon! 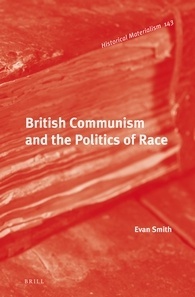 Meanwhile excerpts from the chapter written by myself and Jon Piccini on the Communist Party of Australia and the ‘White Australian Policy’ can be found here and here. The far left in Australia – as has been revealed by edited collections on its equivalents in the UK, USA and elsewhere – had significant effects on post-war politics, culture and society. The Communist Party of Australia (CPA) ended World War II with some 20,000 members, and despite the harsh and vitriolic Cold War climate of the 1950s, seeded or provided impetus for the re-emergence of other movements. Radicals subscribing to ideologies beyond the Soviet orbit – Maoists, Trotskyists, anarchists and others – also created parties and organisations and led movements. 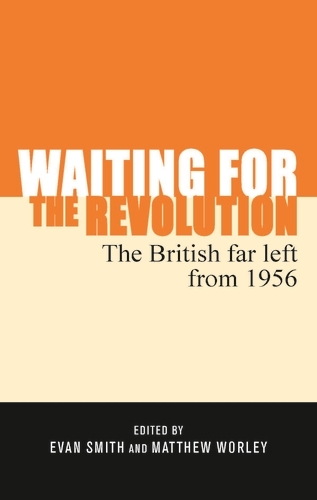 All of these different far left parties and movements changed and shifted during time, responding to one political crisis or another, but they remained steadfastly devoted to a better world. Equally, members and fellow travellers of the CPA and other far left groups instigated or became centrally involved in struggles for indigenous rights, gender equality, ending immigration restrictions, stopping the spread of nuclear weapons and fostering peace—alongside continuing work in trade unions. In starting these groups, providing personnel, funding and guidance, far left activists contributed in no small way to the reforms that have changed Australian from the racist, sexist and parochial society of 1945 to one which is now multicultural, champions gender equality and is open to the world. The far left’s contribution to culture also cannot be ignored, with the CPA in particular providing a home for writers, poets, film makers and others who found their experimentation unwelcomed in an Australia in the grips of the cultural cringe. Lastly, the Australian far left has also had a fascinating – if troubled and convoluted – career of ‘mainstreaming’ itself, whether through aforementioned cultural organisations, or through working with the social democratic Australian Labor Party, forming their own electoral alliances, or reaching out with mass market books. As such, while the far left might have never led a revolution in Australia, it has inarguably played a central role in revolutionising it. The study of protest movements is exploding around the world. Major research and publishing projects charting the far left – particularly set around that halcyon year of 1968 – have appeared in most western nations in recent years. Yet, no such comparable body of work exists for Australia’s vibrant and exciting far left movements in the post-war era – from the Communist Party of Australia to smaller ideological groups, their intersections with broader movements for women’s, indigenous and gay liberation and broader effects on culture and society. By analysing far left movements in Australia from 1945 to the 1980s, these interconnections are explored in depth, and a light can be shone on the current state of Australia’s left and progressive movements. As such, this book’s key strengths lie in its broad range of topics – from the politics of Australian communism in its various forms to the far left’s interactions with the women’s, gay, anti-nuclear, anti-war and indigenous groups, as well as attempts to mainstream its appeal via electoral politics, government compromises and mass media. This work exists at the intersection of academia and activism, offering politically and theoretically informed chapters which provide both valuable scholarly interventions into key local and global debates, as well as casting light on contemporary struggles around the world. As such, its readership will be broad, encompassing activists of all ages and across a variety of causes, as well as the growing body of academics and postgraduate students studying and teaching global radicalism, as well as scholars engaged in 20th century history in general. This collection, bringing together 14 chapters from leading and emerging figures in the Australian and international historical profession, for the first time charts some of these significant moments and interventions, revealing the Australian far left’s often forgotten contribution to the nation’s history. Stay tuned to this blog for further information about the volume in the near future! I have been in discussions with various people over the last few months about how movements ‘remember’ themselves and how they engage with their ephemeral history. I am interested in how these movements have often self-archived their materials and what they have done with these materials – are they open to researchers and people interested interested in the history of these movements? Some organisations and movements (as well as certain individuals) have donated their historical papers to various university archives or museums. These are valuable to researchers, but still privilege those who can gain access – usually academics and independent researchers who can afford to do archival research on site. However some organisations and enterprising researchers are overcoming these obstacles by scanning and digitising the materials of the various progressive and left-wing movements across the Anglophone world. Sites such as the Marxist Internet Archive have been scanning many American, Canadian, British, Irish and Australian documents from the international communist movement, including various Trotskyist and anti-revisionist groups. A number of institutions across the globe have followed, such as the University of Wollongong’s Communist Party of Australia journals, the collection of South African radical material digitised by DISA, the Anti-Apartheid Movement collection at Oxford University, and the Amiel and Melburn Trust collection of British new left journals and the CPGB’s Marxism Today. As well as these institutional initiatives, others are digitising their historical documents at the grassroots level. This can be seen with the Red Mole Rising website, which is archiving online the materials of the International Marxist Group, the Irish Left Archive, the Red Action archive and the Anti-Fascist Archive, amongst others. The wonderful thing about these online archives is that they are democratising the research of these movements. Anyone with a computer and an internet connection can now access these documents, without incurring the costs of doing archival research. This is particularly helpful for those conducting research internationally. The downside is that these initiatives are often costly in terms of equipment and labour, with individuals having to volunteer a lot of their time and effort to provide these resources for others. Also by relying on the efforts of individuals with access to certain collections, there are significant gaps in what is available online. For example, I would like to see more stuff from Militant and the Workers Revolutionary Party made available. It is exciting to be conducting research in this era of increased digitsation, but there are limits to what we can access at the moment. More people need to get involved – either providing original documents, or offering their services in the scanning process, or by helping out with the costs of hosting the websites (particularly as Scribd and Dropbox are increasingly used to hold these large file depositories). At the same time, many original activist documents are languishing in people’s attics, basements, garages and other storage areas. These need to be located and preserved. If you have a collection of left-wing ephemera stored away somewhere, do try to find it and think about donating (or selling or at least, lending) it to people who can digitise it and preserve this (often obscured) history. I hope this starts a discussion about how historians and activists can work together to help ensure that the documentary history of the international left is not overlooked. 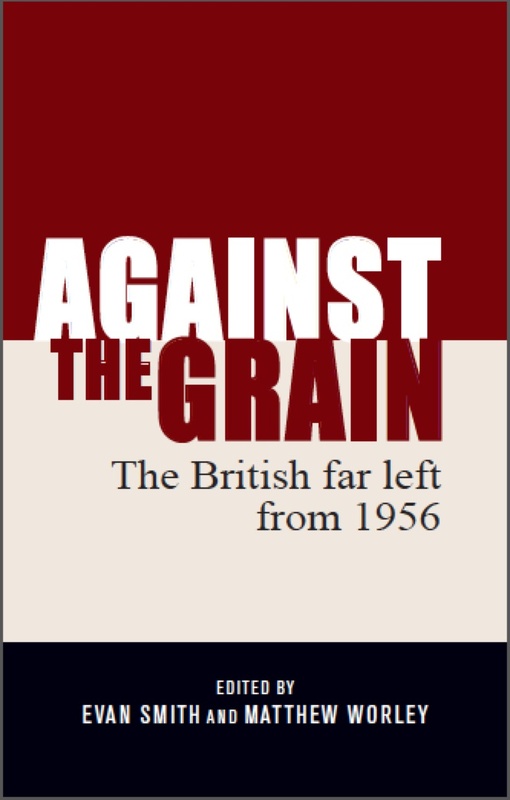 This is just a quick post to let people know that you can pre-order the paperback version of our edited collection on the British far left, Against the Grain: The British Far Left from 1956, directly from Manchester University Press (to be published in December). 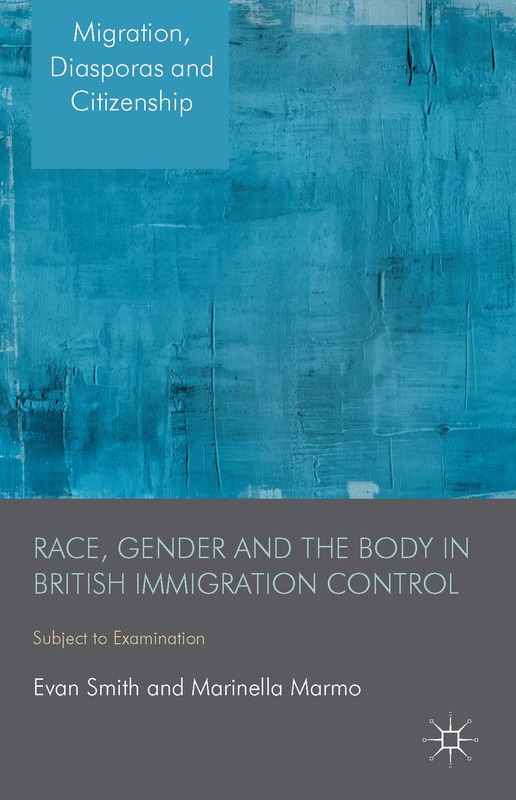 Furthermore, if you pre-order now, you can take advantage of Manchester University Press’ summer sale and get the book for 50% off (that is £9 plus postage!). When ordering the book, use the promo code ‘SUMMER16’. Unfortunately this offer is for UK and Europe only. EDIT: Australian people interested in pre-ordering the book can do so via Book Depository. At the moment, you can order the book for $28 with free shipping. Order here. Or any other aspect of the Australian far left if suitably interesting. We welcome proposals from both scholars and activists, but emphasise that chapters must be presented in an academic format, written ‘objectively’ and with references to primary source materials. An internationally recognised publisher has already shown interest in publishing the collection. Please email any editor with any further questions. Recently the concept of ‘no platform’ was in the news again when there were attempts to cancel a talk by Germaine Greer at Cardiff University. While there is no doubt that the use of ‘no platform’ has expanded since its first use in the 1970s, the term is bandied about in the media with little definition and understanding of how it was developed as a specific response to the fascism of the National Front (and later the British National Party). This post looks back at the origins of the term and how it was developed into a practical anti-fascist strategy. In the early 1970s, the term ‘no platform’ was first used to describe the anti-fascist strategy of denying fascist organisations the public space to organise and disseminate their propaganda. The denial of public space had been an integral part of the militant anti-fascist movement since the 1930s, employed by the Communist Party of Great Britain (CPGB), various Jewish groups and other assorted anti-fascists. Fighting Oswald Mosley’s BUF, these anti-fascists broke up meetings, occupied spaces to prevent the BUF gaining access and mobilised massive demonstrations to physically confront the fascists in the streets. This continued after the war with various groups, such as the 43 Group, the Association of Jewish Ex-Servicemen and the Revolutionary Communist Party, joining the CPGB to combat Mosley’s Union Movement. As well as physically confronting the UM, part of the anti-fascists’ strategy was appealing to the local councils, particularly in boroughs where the Labour Party was in charge, to deny the UM (or its various aliases) access to any council property. The anti-fascist movement was quite successful in its approach and Mosley fled to Ireland in the early 1950s. Until the emergence of the National Front in late 1960s, the fascist groups in Britain remained small and the anti-fascist movement gradually faded away. Forming in 1967, the National Front brought together a number of disparate fascist and anti-immigration groups and by the early 1970s, it was making headway by attracting disaffected Conservative Party voters who felt that the Tories were ‘too soft’ on immigration. Particularly when the Ugandan Asian controversy emerged in 1972, the NF publicised its opposition to letting these British citizens into the country after the Heath government acknowledged that it had legal reason to deny them entry. The first use of the term ‘no platform’ (that I have been able to find) comes from that year. The Red Mole was the newspaper of the International Marxist Group (IMG), a Trotskyist organisation that built quickly amongst the student and anti-Vietnam War movements in the late 1960s. 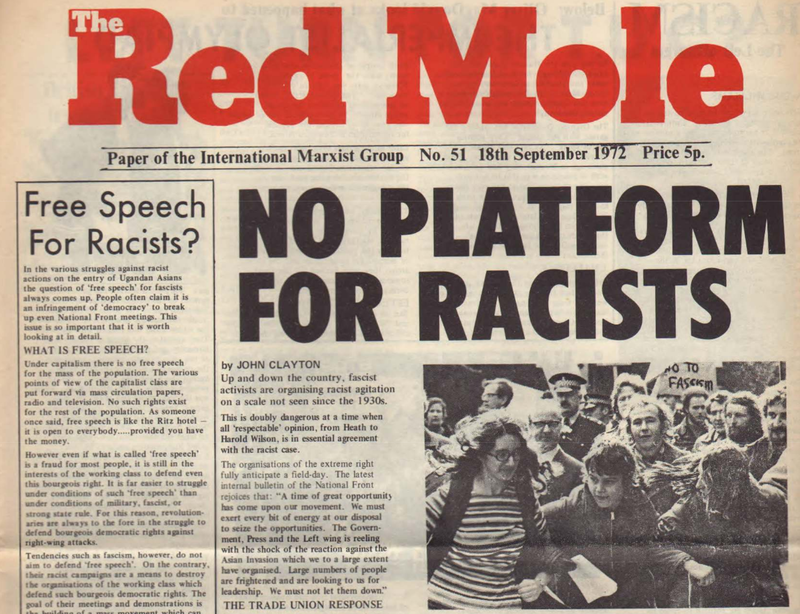 In the issue for September 18, 1972, the front page headline declared ‘NO PLATFORM FOR RACISTS’. It described the NF and the Monday Club (a pro-empire and anti-immigration grouping within the Conservative Party) as ‘mortal enemies of the working class’ and stated that these two groups ‘must be stopped in their tracks’. The newspaper argued that these groups needed to be confronted and were ‘not going to be convinced by rational argument’, calling for ‘a concerted counter-attack’ at meetings of both groups. Conference recognises the need to refuse assistance (financial or otherwise) to openly racist or fascist organisations or societies… and to deny them a platform. However conference believes that in order to counter these groups, it is also necessary to prevent any member of these organisations or individuals known to espouse similar views from speaking in colleges by whatever means necessary (including disrupting of the meeting). Student unions were called upon to ‘prevent any racist or fascist propaganda being displayed, sold, distributed, or propagated through meetings by whatever means may be necessary’. The fascists will not be defeated by resolutions or statements alone. There are three specific issue which face us immediately: the activity of the right in the colleges, the campaign against the reactionary anti-abortion group, SPUC [the Society for the Protection of Unborn Children), and the fight against racism. The other groups of the left rejected joint action around these issues. But it is only by such joint mobilisations, by confronting the right wing head-on, that the fascists and racists will be routed. To debate with Eysenck, to treat him as a genuine scientist, is thus to indirectly legitimise Powellism. This is not to say that we should go out to break up meetings which he addresses – the real threat lies in organised fascist groups – but rather that we should picket them and organise counter-meetings in order to show up the real nature of his ideas. The racists and fascists of today are not something that we can ignore. They are a growing menace. The liberties we have today are worth defending, small though they are. Fascism aims to smash, racism creates the conditions for their destruction. We cannot allow the open fascist, or the concealed fascist working in the Monday Club or some similar organisation to gain a hearing. Every meeting that they hold gives them confidence. Every apologist for racism lends them comfort. Every liberal who debates with them gives them aid – much against their will. Every time they are stopped from meeting, every time their meetings are broke up, their task becomes harder and harder. The moral of the fascists fall. People turn away from them as a miserable and pathetic group with nothing to offer. Every success that we have demonstrates to the waverers that we are a better solution. That is the only way to fight fascism and racism. While the NUS resolution, as well as the IMG and the IS, all saw the Monday Club to resemble a proto-fascist organisation that should be barred from meeting and organising on university campuses, the CPGB stressed that the Monday Club (from which there was a conveyer belt of recruitment into the NF in the early 1970s) was merely a group within the Conservatives and thus should be allowed to organise publicly. Furthermore, the CPGB was worried that the phrase ‘by any means necessary’ could be interpreted in a number of ways and was concerned about physical violence at public events involving sections of the non-fascist right wing, such as Eysenck’s university tours. This had already occurred the previous year when the tiny Maoist group the Communist Party of England (Marxist-Leninist) (featuring the future leader of the Workers Institute for Marxism-Leninism-Mao Zedong Thought, Comrade Bala) broke up a presentation by Eysenck at the LSE. Students should perhaps remember that frustration which leads to a denial of the right of one section of society is not something new. It is classic pattern of fascism. Our members overseas have been singled out for abuse, threats and outright economic attack by powerful extreme right-wingers during the time of the last Government. All our conference agreed was that at least they should not be subject to that abuse in our own student union. One must accept that to deny racists and fascists a platform is to ‘limit freedom of speech’ but one cannot see this freedom as something which exists in the abstract. It is a freedom which is already limited by such laws as the Race Relations Act and the law of libel, and must also be seen in the context of a class society in Britain which limits the freedom of speech for the vast majority of people… In refusing to assist the spread of racism the NUS is fighting for a freedom of even greater importance: the freedom to live without discrimination on the basis of race. It is only in relation to reality that principles of freedom can be seen. It is not an abstract intellectual exercise. Because of the controversial nature of this resolution, the NUS held a special emergency conference in London on 15 June, 1974. This was the same day that the NF attempted to hold a meeting at Conway Hall in Red Lion Square and a counter-demonstration was held by Liberation and other anti-fascists, including the IMG. The resulting melee between anti-fascists and the police led to the death of Warwick University student Kevin Gately. At the June conference, the debate was over the application of resolution. Dave Cook, writing again in Morning Star (21 June, 1974), said that the IMG and the IS wanted to maintain the resolution as it was passed, ‘which dictated a common response to all racist and fascist organisations in all situations’. The Communist-affiliated Broad Left group opposed this arguing that ‘the best way to implement national policy was for decisions to be made by each individual union in accordance with its local situation’. Put to a vote, the amendment suggested by Broad Left failed to get over the line and the resolution remained as it was, despite the Federation of Conservative Students seeking the opportunity to defeat the resolution in its entirety. But the death of Gately at an anti-fascist demonstration bolstered the argument made by the Trotskyist groups – if fascism was not countered ‘by any means necessary’, then people on the left were to become targets of violence. By this time, the National Front were starting change tactics. For most of the early 1970s, the NF had played up its ‘respectability’ and tried to attract disaffected Tory voters (and members) who were anti-immigrant, pro-empire and anti-Common Market. ‘No platform’ was probably at its most controversial, but also very necessary, during this period, when a determined anti-fascist movement was needed to break the respectable veneer that the NF was putting forward while trying to woo the Tory right. Communists support, and will defend to the utmost, the right of people to freely speak their mind. But to attack people because they are black is not a political argument. People form their political views on the basis of conviction. They are born with their colour. That is why to attack someone because of his or her race is to attack that person as a human being. Their political views can change, colour cannot. Labour candidates should not share platforms at meetings or appear on constituency programmes on radio or television with candidates or other members of the National Front. ‘No Platform’ has been applied to many people by the workers’ movement. Trade unionists, for example, would generally expel employees who attended their meetings. Print workers sometimes censor by blacking a newspaper editorial attacking the unions. When Mr. Godber, Tory Minister for Agriculture, [was] sent to Birmingham one day last year to do a public relations job for Tory price policy, he was mobbed off the street by angry housewives. All these actions are against ‘free speech’ and sometimes involve a physical struggle. Throughout the 1970s, the ‘no platform’ policy was challenged at the NUS annual conference. At the 1977 conference, concerns were raised about demonstrations against Sir Keith Joseph speaking at Essex University. In The Guardian (March 23, 1977), John Fairhall wrote that the NUS Executive Committee felt that actions, such as the one against Joseph, were ‘against the interest of the union, and damage an anti-racialism campaign’. Alan Elsner, a member of the Union of Jewish Students, wrote in the New Statesman (May 13, 1977) that the Joseph incident ‘heightened the fear that “no platform” policy could be used as a means of silencing people whose views might be controversial or unpopular’. Elsner also raised the controversy over the use of ‘no platform’ against organisations that were explicitly Zionist or supporters of Israel. A student union would do anything it could physically – such as picketing and demonstrating – to prevent people whom the student union decided by a general meeting vote were racists or fascists from speaking on a campus. But prevention would stop short of violence. the policy often means little in confronting racism and sexism on more than an individual level. But what is more, it broadens the definition of no platform to an almost unworkable degree. The original no platform went for stopping organised fascists and racists, because their organisation was such a threat. That is not the case with individual members of the rugby club, however noxious they might be. Those people have to be defeated politically, in open and hopefully large union meetings. The first is to widen the policy far too far, and therefore allow the right wing to make capital from particular issues. The second is to get trapped into allowing the right to pose as defenders of free speech. Nothing could be further from the truth. It seems that student activists at British universities have not heeded German’s warning and that the strategy of ‘no platform’ employed against political opponents far removed from the original targets, the organised fascist far right. ‘No platform’ was developed as a specific tactic to prevent the encroachment of the National Front (and the Monday Club) onto university campuses in the mid-1970s. However it seems that almost from the time of its implementation, it has been open to misinterpretation and abuse by certain student groups. This post has sought to show that before it became a widely used tactic by various student groups, ‘no platform’ had a discreet and specific context to be used in an explicitly anti-fascist framework. Contemporary discussions in the media of the tactic often ignore this origin story, but do so at their own peril.